I've updated the Innovating Exits post with graphs from one of the system's past trades. I've also described a bit of the system in the comments section of the post. Check it out. I shared some quick research on Trader Mike's beloved T2108 indicator in a recent post of Mike's. You can read my comments here. Trader Mike uses the T2108 as an overbought/oversold indicator on a daily timeframe. I find it useful as a trend strength indicator on a weekly timeframe. Just goes to show...more than one way to skin a cat. You know, there are just times when you need to jump on bike and get out of dodge. 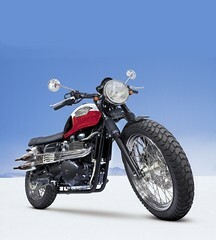 What better bike than this new one from Triumph...The Scrambler. Source: Forty Years on Two Wheels.